With the approaching fever of internet surfing and social media, a large number of population is becoming potentially vulnerable to a lot of danger and cyber abuse because everyone knows that the Web is not safe anymore. Since there are two sides to everything, the Internet also has a dark and harmful side. Fortunately, AnchorFree’s Hotspot Shield is the leading VPN (virtual private network) that encrypts our network and internet browsing by altering the traffic route and reverting it from the company’s secured server system. With instant setup, fast access, and secure servers, Hotspot Shield is one of the most reliable VPN service providers in the market. Hotspot Shield provides easy-to-use VPN services, both free and Elite. Encrypt your networks, start surfing with protected, anonymous browsing, and much more with this amazing software. So, let’s get the review started covering all the immense number of features that it offers along with the plans and pricing. Always-On Protection for all the open networks and protecting the users from harmful threats, Hotspot Shield is giving a fierce competition amongst all the VPN services providers. 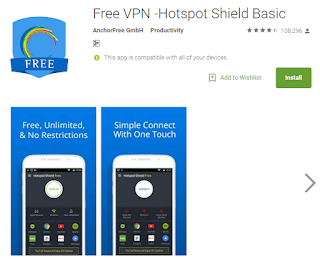 With over 400 million downloads, Hotspot Shield is an amazing VPN service offered by a US-based software developer company AnchorFree. The company aims to deliver programs, tools, and services emphasized for the security and protection of current generation. With surging growth and revolutionary technology, the company has expanded its services to more than 17 countries worldwide. So, Let’s get into the fantastic line of features that this software offers. All the networks or the redirecting servers are secured with OpenVPN and 256-bit AES encryption for the precise level of protection. Moreover, all the vital information is protected by considering privacy and security as the principal points. Hotspot Shield offers anonymous web browsing, unrestricted access to blocked websites, secured Wi-Fi and protection from snoopers, thieves and internet frauds. Also, the company promises to restrict all the user details encrypted and safeguarded from malware and scam websites. Most of the unusual features are limited to the Elite Users, but the company has much more to offers for the free users too. Downloading the setup and installing it on your device is pretty easy and only takes minutes to configure and to protect your network with encryption. Hotspot Shield automatically provides a one-day trial of the Elite account to all the free users. So, if you’re satisfied with all the incredible security measures, then you can purchase the paid subscription to continue the services. Moreover, you can stay with the free version too. You can download Hotspot Shield Free Version from here. Most of the time changing of connections and network switching happens very fast and automatically. You can also toggle between Selected Sites and Full Protection modes manually as well as the access to restricted and blocked websites by Hotspot Shield VPN. Hotspot Shield mostly operates on an ‘always-on’ policy and enables the VPN services along with Windows, once the user is logged on to the device. You are also eligible to disconnect the service whenever you like and by default, the services auto-start after a 15-minute period. AnchorFree is a leading software developer company and also provides Hotspot VPS clients for Windows, Mac, iOS and Android devices. The free version of the client works seamlessly on the Android Smartphone. We didn’t face any struggle while connecting to the network. It is also worth adding, that the app automatically linked to the secured servers and complimented the browsing experience with security and protection. Talking about the performance and the stability of the network services, Hotspot Shield did a spectacular job with configuring the speed and safety for both free and elite versions. Sometimes, we faced the connection breakage, but the VPN services tried to reconnect automatically for seamless performance. With hours of testing that included streaming of HD content and downloading, Hotspot Shield did a remarkable job and did not fail to satisfy our expectations. Also, the software passed all the DNS and IP leak tests. All in All, the free version performed well than other VPN client services. Customer & Technical support is available 24*7 to all the users, and you can quickly raise a ticket or mail your problem directly to the team. You can also get tons of answer to your specific questions in the Knowledge Base, and the Forum hosted officially on the website. 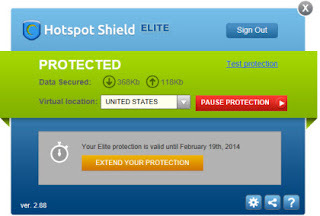 Although a majority of the unusual features are limited only to the premium (Elite) account, Hotspot Shield also has much more to offer to its free users. The free version is time-unlimited and gives a glimpse of all the spectacular features that the Elite version provides for enhanced security and encryption. If you’re craving for the premium plan, then you can purchase the Elite Subscription from its official website with a variety of payment methods and a 30-day money back guarantee. You can avail unlimited access to restricted sites, protected browsing, and private surfing with a monthly, quarterly or on a 6-month subscription pack. 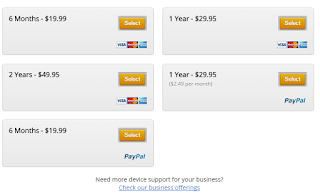 The pricing starts from $29.95 for an annual subscription. Cloud-based Protection, Malware & Spam proof browsing and much more is provided with the Elite Pack. You can get more information about the pricing and plans here. Overall, Hotspot Shield is a perfect VPN client that fits all your security and protection concerns along with seamless performance. Do let us know what you think about this product and let us find out more in the comment section below.